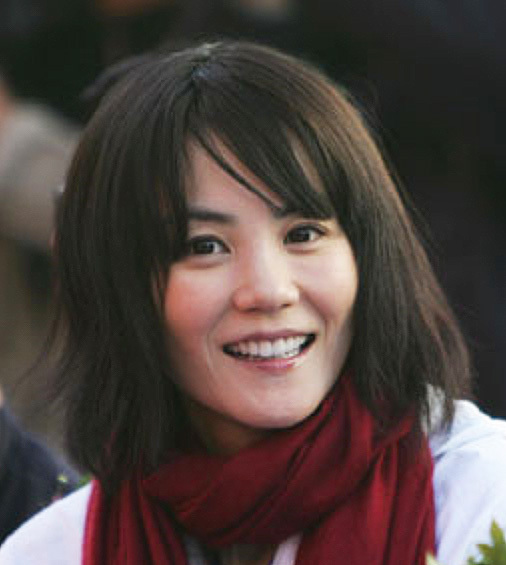 In Lhasa, on November 28, Faye Wong (王菲) was an angel in white. The little boy in the photo with Faye and Li Yapeng (李亚鹏) has had his life forever changed by the SmileAngel Foundation. In the first photo, we have a Faye smile that we haven’t seen for quite a while. It’s radiant — the true smile angel — reflecting the compassion that she has for children who have much to bear. These two could be the Asian version of Brangelina! What could they be called?? I’m out of touch with what other celebs in Asia do, but from memory, there’s none of them who do charities in their spare time. They all turn up to the annual fundraising concerts but they don’t personally sponsor any charities. So this is heartwarming to see. And even more lovely is how humble they are. They don’t act flashy and strut around thinking “I’m the star of the show, look how generous I am.” They are so courteous as guests and happy to have an everyday conversation with the “real” stars of the charity (the kids) and not use this as a publicity stunt like many hollywood stars do. Bless’em! @Deb At my site I wrote a post on Chinese celebs who do charities in their spare time…There’s actually a lot, ones that I didn’t even write about. I think Jet Li is probably on par with these two with his one Foundation. But it doesn’t diminish the fact that these two have been really doing a lot for their foundation to really help people. You can see that they are doing it out of love, love for seeing these kids get the same chance for normalcy that their own precious daughter has. this is random, but do you have an mp3 of the Skylite Infinite song, sung with Aaron Kwok, in cantonese or mandarin? I was watching it and feeling nostalgic. @ Deb/cfensi – Fayepeng? LOL! Seriously, I think Faye is much more regal and comes across as more of a Princess Di than a celebrity such as Brad or Angelina. Faye has class, and I think she’s more than a star or performer. She’s a Chinese national icon, or symbol, who transcends national boundaries and politics and stands for all that’s good in the world. @ cfensi, I’m sure I have the Pepsi duet somewhere. I’ll hunt through my folders and discs (or online) and post the MV and audio in the next 24-48 hrs. I actually liked it — Faye’s style, look, and delivery. Re Jet Li — well said. I was impressed with his hands-on volunteer efforts in the aftermath of the earthquake. You’re right, many stars are also humanitarians. But I think Faye’s different. There’s a deeper sense of involvement, a connection at a level that more heartfelt than intellectual. I guess it’s because she never “talks” about or tries to articulate what she does. She lets her actions speak for her, and her actions seem to be based on a spiritual rather than rational philosophy. In the end, I feel that her dao is much more genuine. Ah, thank you so much! I would love that video as well. Anyway, I think she’s setting a wonderful example whatever she does. Truly a role model. I’m a Faye Fan but I can’t read chinese. Thanks to fayewongtoday, I don’t have to rely on my friends to read me the chinese entertainment page anymore. Keep up the good work!